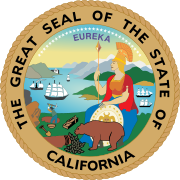 The 1996 California State Senate elections were held on November 5, 1996. Senate seats of odd-numbered districts were up for election. Senate terms are staggered so that half the membership is elected every two years. Senators serve four-year terms and are limited to two terms. Democrats expanded their majority, gaining two seats, one from the Republicans and one from an Independent. ^ "Statement of Vote 1996" (PDF). California Secretary of State. 1996-11-07. Archived from the original (PDF) on 2008-07-31. Retrieved 2008-08-17. This page was last edited on 13 December 2018, at 10:40 (UTC).